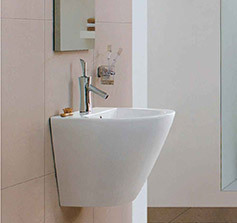 The bathroom basin is a central ingredient to any bathroom project. With a huge range of options to choose from, you’re sure to find a sink that looks beautiful, suits your style and budget, and lasts until your next bathroom refresh. We have an extensive collection of different items, from pedestal, counter top and wall hung sinks, to cloakroom, corner and vanity basins — all designed with you in mind.